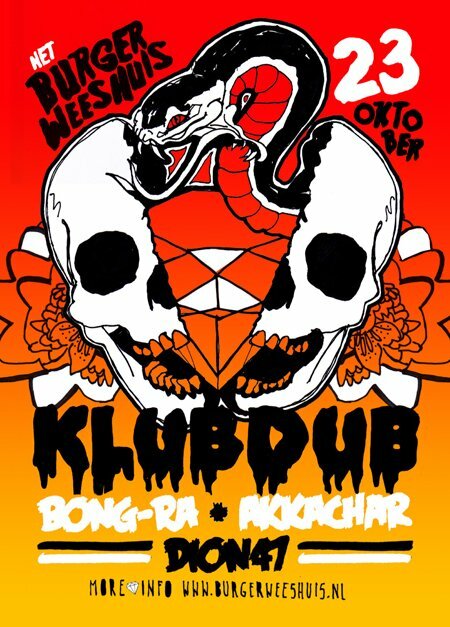 Another Klub Dub night next Saturday in Burgerweeshuis Deventer. Nice line-up again, even featuring some esc.rec. artists this time! Although it’s not on the poster Dion will work together with Radion on this one. Expect roaring dubstep from these two! And although Jason Köhnen (Bong-Ra) isn’t to be found on the esc.rec. roster anywhere, we sure aren’t strangers. I have recently been helping out The Kilimanjaro Darkjazz Ensemble (of which Jason is a founding member) with a bit of advice on how to set up some sort of new label situation for them… I was actually quite honoured to hear that they felt esc.rec. was a suitable role model for that (instead of their current labels Planet Mu or Ad Noisam for example).